It’s the definition of talent. 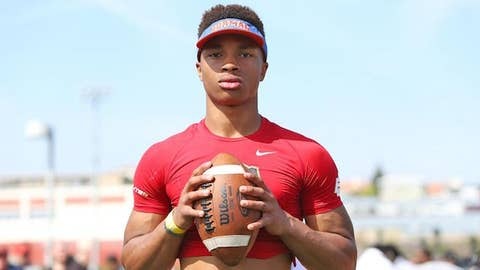 Dorian Thompson-Robinson has yet to start a game at quarterback for national power Bishop Gorman High School in Las Vegas… and he’s ranked No. 7 overall at the position for the class of 2018, according to Scout.com. On Sunday, Thompson-Robinson verbally committed to UCLA. Last season, with National Player of the Year Tate Martell — who’s now at Ohio State — at QB, Thompson-Robinson lined up at receiver and caught eight touchdowns. In mop up duty at quarterback, the 6-foot-1, 195-pound Thompson-Robinson passed for 269 yards and three scores. With Josh Rosen most certainly headed to the NFL after this season, Thompson-Robinson will have five other QBs to compete against for the starting job.